- I'm heading to KL this new year's eve. Apart from the usual Zouk and KLCC and Bukit Bintang, does anyone have know where's a good place to party? - Dammit, go vote for mrbrown ok?! Or... or... or I'll put up photos of my humps to compete with Junne's lady lumps! The good people at KLue magazine have been very nice to me lately. Not only have they been slacking off and secretly reading kennysia.com during office hours (yeah... work), they described me as a "valued peer of KL's growing community of young, creative and involved individuals". Eh? KL? Since when I became a Kuala Lampian? I Kuching boy leh! Those of you living in KL should really go out there and grab an issue. It's always filled with tons of useful info on things to do/eat/watch around KL, most of which even this "valued peer of KL's growing community" is not aware of. 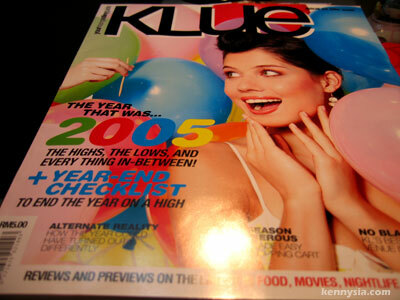 Anyway, this is my contribution to the December 2005 edition of KLue Magazine. I didn't write the following piece, but it's too cute to not post it up. Kenny Sia I have gotta admit this ever since I found your blog, I can't stop checking back every few moments I am online hoping for an update. 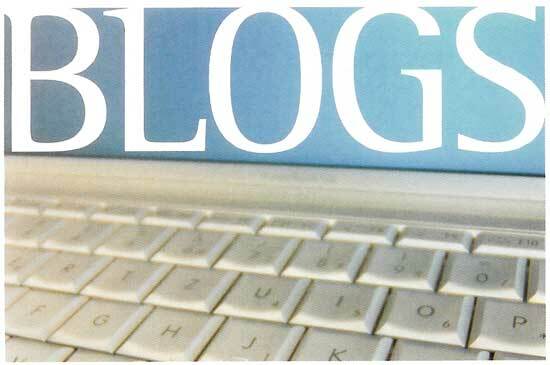 Gosh you have made me a blog addict you evil you! Tsk tsk. Kenny oh Kenny, all your fault lah! Now Francis kena addicted liao. Quick, apologise by marrying me. 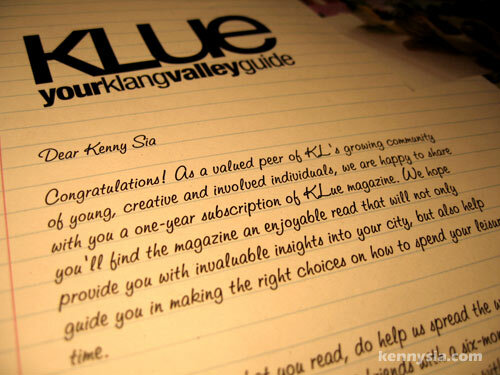 The letter from KLue sure is nice. Talking about aesthetics lah. Who cares who this Kenny guy is. Probably another ah pek trying to make a name by writing about his personal stuff. Joking la. :) Congrats on the feature Kenny! i think ur better off celebrating NYE at home.. or hv a small gathering at home. The traffic is gonna be horrible! CRAP!!!!!!!!! I should've read more slowly. It's an article by you issit. Congrats all the same for getting the chance to write on a proper magazine! AHahhaah Most ppl visit this blog at this time if u see the statistics i think,...but anyways,..wahh so privileged already,...getting free subscription to magazines! Why is it that in the keyboard photo, the letter Z is in between T and U? I thought it should be Y?? - I'm heading to KL this new year's eve. Apart from the usual Zouk and KLCC and Bukit Bintang, does anyone have know where else is a good place to party? sorry ah, mr kenny sia, i'd rather see Junne's humps. anyway, go compete with XiaXue lah, get a journalist job! and be a very famous one too! when all the places in k.l closes, watch the sunrise at the waikiki bar in p.j... CLASSIC! Kenny, if you're going to be in KL for the countdown, you may want to book a room at a nearby hotel so you won't be spending the first 10 hours of the New Year stuck in traffic drinking premium carbon monoxide and being entertained by the Royal Malaysian Projectile-Vomit Orchestra. And more importantly, please, please resist all urges to steal the show at any time by publicly revealing the Coconuts, OK, not even after 12 beers. We're not looking to start the New Year with that kind of Bang. The fireworks will do fine, thanks. I stumbled onto your blog and it's so freakin' hilarious!!! I'll be reading more when I have time! In the past, I used to countdown in town. But lately, I rather stay home, have a port luck organised, with chilled beer and red wine and enjoy the entire KL view. You can see fireworks from several spots. So Kenny, would you want to join me at home to celebrate the countdown and get yourself stuck in the jam for few hours before and after the countdown, yet can't have a complete view of the fireworks?? I'd recommend you skip Luna Bar. It's the monsoon season and the bar for all its aesthetic pleasantries doesn't help stop the rain from coming in at all. And I love your blog. Cheers! Wah, I think now your balls as big as water melon already lah! eh Siggplus, how come no one calls KL people Kuala Lumpurians ah? Kuala Lampians... hmm, sounds like Kulat-Lampa-ian. Since when KL ppl are known as Kuala Lampians? I thought it's KL-ites???? kenny, saw your pic with yvonne foong in star today. the t shirt is gorgeous. and i wan. but i kenot go bangsar. since u know her. ask her is there any other way for me to get one?i like the shirt very much. Hi Aunty Cicak! lol! Where do you stay? You can get it in Subang Jaya too. Or if you're free on the 14th, the shirt is on sale at Legends Hotel, KL from 5-8pm. OR, MPH MidValley on 20th December. Geezz... I think, I need to put up a tour schedule on my blog. hey wat happened to sixthseal? and, congrates! you are undeniably hilarious! KLue roxxess to the maxxess man! Fabulous guide! I liked a looking at. Im hoping to enjoy a book a whole lot more on your part. My partner and i you got awesome understanding and so imagination. What i am hugely content within this important information.